This month’s food fave roundup is one of my favourites because some of these food have helped me achieve my ideal weight without depriving me from enjoying eating. I love that more and more products are easily available in our favorite supermarket or online. First up, Yummy Organic Food Products. Audrey, the woman behind the company sent me two of their lovely, healthy and 100% natural British products to try. They are Teapigs Tea and Tiptree Jam. I’ve never been to England, (I hope to visit when the lil’ GJGs are a bit older so I can either bring them with me or they be good enough to be left with extended family heehee) and I’m not really familiar with British products so I was pretty excited to try what they sent me. 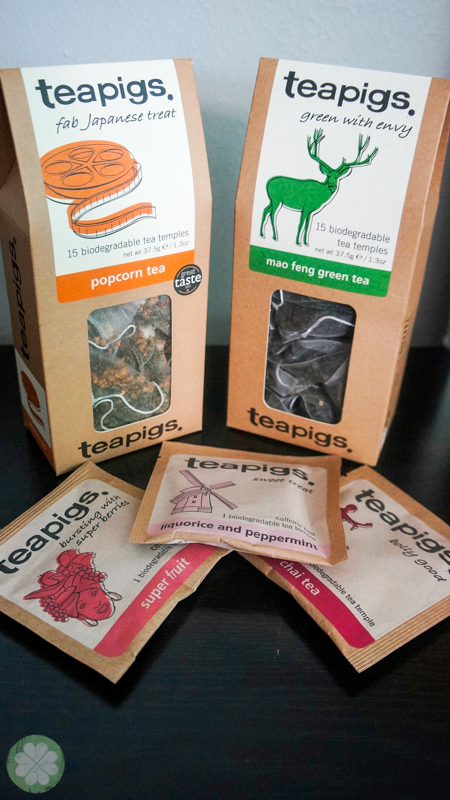 Teapigs Teas are made fro real quality tea- whole leaf, herbs and flowers. They have a wide range of creative and tasty flavors including Chamomile Flowers, Liquorice & Peppermint, Popcorn, Créme Caramel and Super Fruit. They also have everyday favourites such as Green Tea, English Breakfast, Earl Grey, Chai, Peppermint and Lemon & Ginger. My personal favorite is the Popcorn tea as it’s surprisingly delicious. Tiptree Conserve froM Essex, England has held a royal warrant since 1911 as an official supplier to the Queen of England. Ang taray lang di ba? If it’s good enough for the queen then it’s the best for me! I gotta say this Sweet Tip Raspberry got me looking forward to mornings when I feel I need a lil’ dose of sweetness. 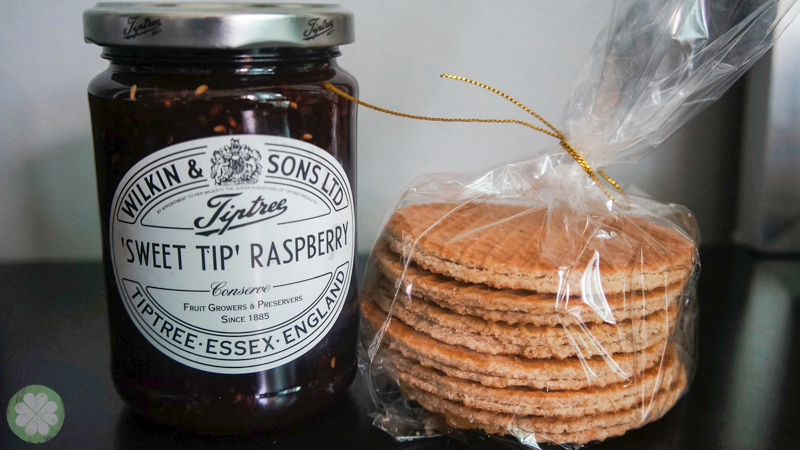 So much so that I had to go to Pegi Waffle to buy more Dutch Stroop Wafer to smother the Tiptree Jam to. Noms. They also distribute The Berry Company Juices (I’ve seen these but I haven’t tried it), Cracker Drinks juices, Clipper organic teas, Dorset Cereals, Eat natural bars and more. Teapigs Tea is available at Landmark, SM Supermarket Aura, SM Supermarket Makati, SM Hypermarker Mall of Asia, SM Hypermarket Pasig, SM hypermarket Clark, SM Hypermarket Sucat, Robinsons Supermarket in Robinsons Place Manila, Magnolia, Nuvali, 88 Forbes Town Fort Selections and Las Piñas, Gavino’s Japanese Donuts Greenhills Town Center, Urban Pantry Greenhills, Fooda Savermart Cebu, Gaisano Davao and Iloilo Supermart. is available at Landmark, SM Supermarket Aura, SM Supermarket Makati, SM Hypermarker Mall of Asia, SM Hypermarket Pasig, SM Hypermarket Clark, SM Hypermarket Sucat, Robinsons Supermarket in Robinsons Place Manila, Magnolia, Nuvali, 88 Forbes Town Fort Selections, Waltermart E. Rodriguez,Waltermart North Edsa, Cherry Congressional, Hi-Top Quezon Avenue, Gavino’s Japanese Donuts Greenhills Town Center, Urban Pantry Greenhills, Fooda Savermart Cebu and Gaisano Davao. I discovered Take Root when I was at Hole In The Wall, Century City Mall. They’re available at Spruce’s stall. I was intrigued because I was on the lookout for a delicious yet healthy munch. After consuming the large bag of Kale Chips, I was hooked. 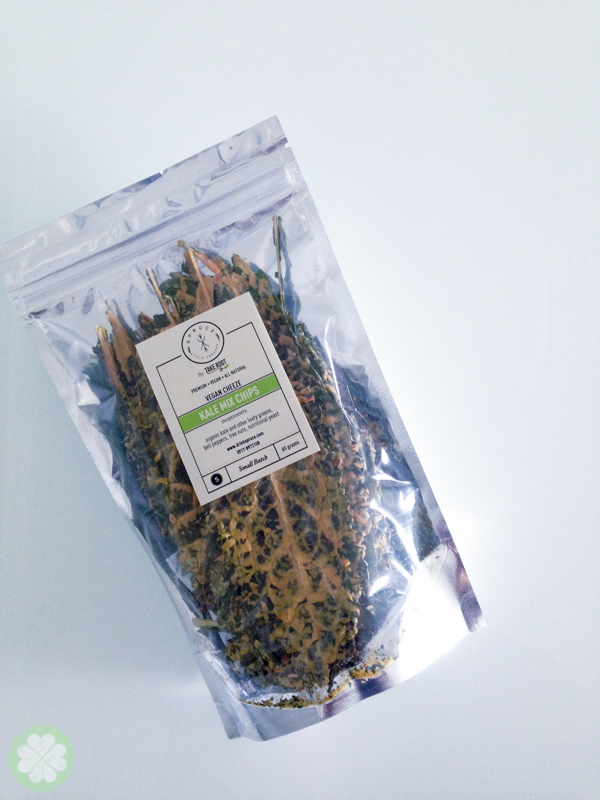 Take Root’s Kale Chips are made with care, over a lengthy 12-hour process. Each leaf is carefully picked, washed and massaged with a blend of vegetables, nuts and spices then slowly dried to crisp perfection to preserve essential nutrients and enzymes. It’s low in calories and fat but packed with vitamins (A,C and K) and minerals (calcium, potassium and iron). They’re totally 100% guilt-free! Take Root also has granola and bliss balls. Order online at www.takeroot.ph or view their full list of partner stores HERE. 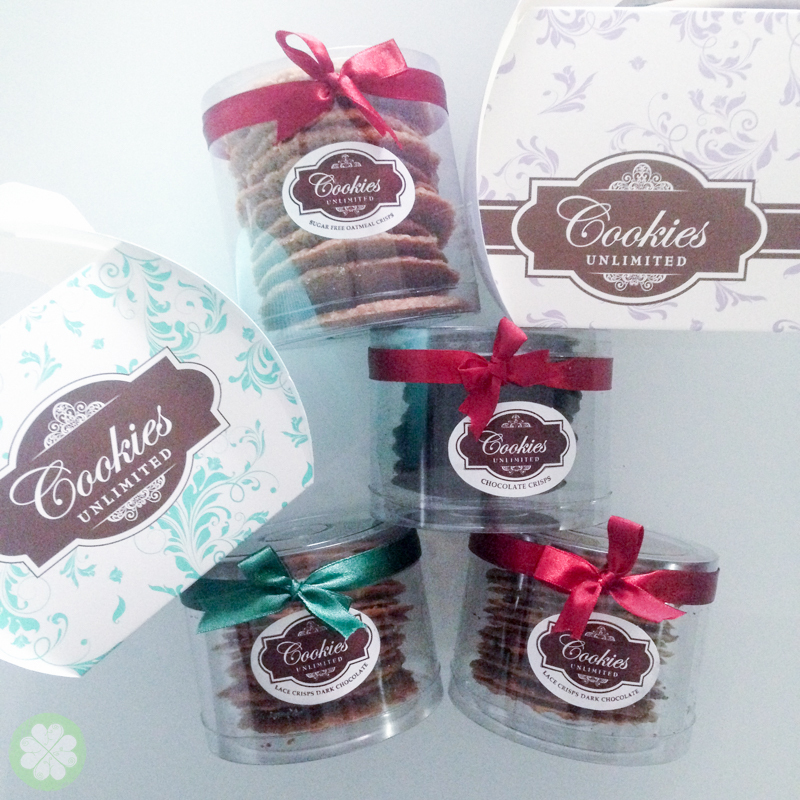 Lace Dark Chocolate Cookies, Sugar Free Oatmeal Crisps, Chocolate Crisps & Almond Thins. OMG. Need I say more? These delectable treats are my weekend cheat food. But honestly, when I received these I immediately consumed a tub of Lace Crisp Dark Chocolate. Crispy thin cookies that breaks beautifully upon biting, letting the dark chocolate ooze out. Place an order through 0917-831-5050 and pick up at their kiosk located at the 3rd level SM Mega Fashion Hall. Move over VCO (Virgin Coconut Oil), there’s a new oil in town. Laurin is odor and flavor-free, it stays naturally liquid so it’s perfect as a gourmet oil or daily health supplement. It’s made from coconuts grown naturally in the Philippines. From pure coconut oil, Chemrez (the manufacturer of Laurin) uses a multi-step distillation process in order to produce CocoMCT. 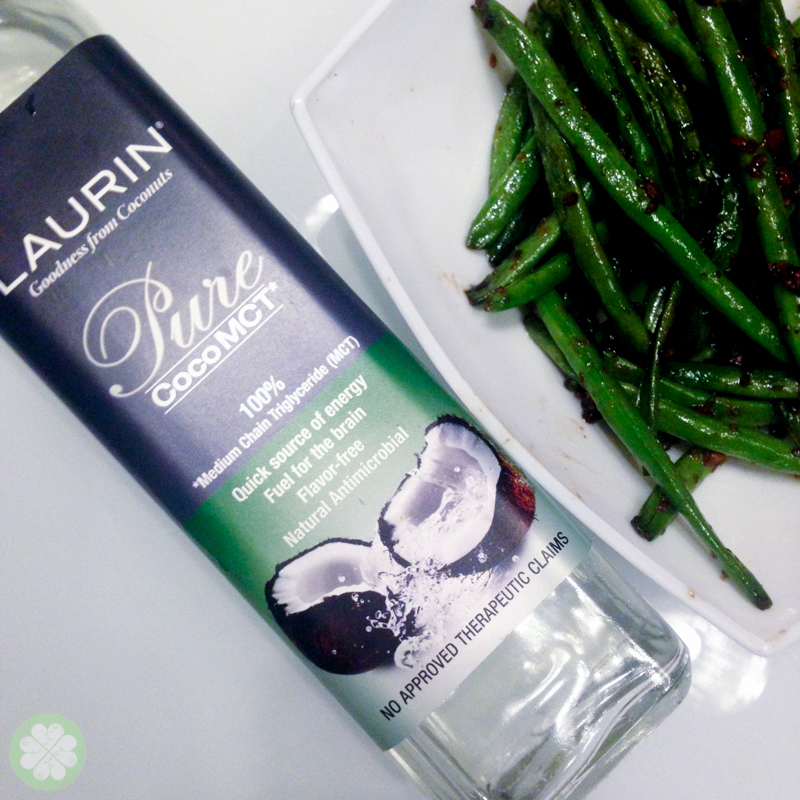 It takes five times more coconut oil to produce one liter of Laurin, making it one of the purest and healthier vegetable oils in the market today. I use is as gourmet oil for my salad, oil for sautéing my vegetable (like the French Beans in the photo) and even tried it as a supplement (1 to 2 tablespoons), while some have used it as a topical oil too. I love that it’s not heavy when I take it as a supplement and no yucky feeling after ingesting it. Laurin is available at ECHOstore in Salcedo Makati, Serenda Taguig, Nurture Nook Shop and The Flow Shop. Call (02) 635-9000 for more details. Got any food faves? Share nyo naman I wanna try it too!